Alibaba has teamed up with Israeli-based QR technology company Visualead to release a “new standard” of dotless visual codes for packaging, aiming to crack down on counterfeit products, said Visualead today. The announcement comes three days after luxury goods company Kering Group submitted its second lawsuit against Alibaba, claiming that the e-commerce giant was not doing enough to stop the sale of counterfeit products on its platform. Visualead currently works with Kering subsidiary Yves Saint Laurent in China, as well as YSL licence-partner L’Oreal. Visualead-partner brands including L’Oreal and Ferrero Rocher are already being sold in China with the new codes on their packaging as part of Alibaba’s new Blue Star platform, which focuses on product engagement and anti-counterfeiting. “Each product carries a uniques dotless code, and when consumers see this code they will get immediate feedback on whether the product was fake,” Oded Israeli, VP of Marketing at Visualead, told Technode. Enterprise communication is a hot topic in China market right now. Companies including Mingdao, Fxiaoke and WeChat are all rolling out solutions designed to help office communicate better. Teambition is a promising player also trying to edge into the growing field to completely replace business email for the inward facing company communications. Teambition is a software as a service (SaaS) platform that provides products and services to foster team collaboration and project management, attempting to be a mix of Silicon Valley’s Slack, Trello and Dropbox. Available on the web, Android, and iOS, the service is designed for different industries including TMT, education, advertising, manufacturing and administration. The company received Pre-A investment from Gobi Partners and was selected as Red Herring Top 100 Asia winner in 2013. Last year, the company was inducted by Microsoft Ventures Accelerator and has secured US$5 million of Series A funding led by IDG, followed by Vangoo Capital Partners. The company is comparatively young. CEO Junyuan Qi is 24 years old and 53 members of the company are in their mid twenties. In TechNode’s interview with CEO Junyuan Qi, he shared the philosophy behind Teambition. What is the motivation behind Teambiton? Virtual reality and 3D interaction are among the most exciting fields in tech right now. TechCrunch Shanghai is honored to invite two experts in this arena to share their insights on the future of these fields. 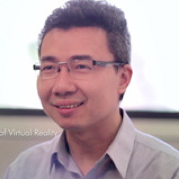 Dr. Fei Yue is the co-founder and CTO of Silicon Valley-headquartered startup uSens Inc. Fei has 12 years of experience as a lead scientist and is an advanced expert in human-computer interaction and computer vision. He has contributed to many important products at Nokia, Motorola, Panasonic and Amazon. Prior to that, Fei founded Infinite 3D, a startup innovating virtual reality 3D user interface, where he developed Cube software system in 2004. The system transforms Windows 2D interface into Virtual 360 degree 3D User Interfaces. Fei earned his B.S. degree in Physics from Fudan University and his M.S. and Ph.D in space physics from Rice University. Following our Demo Day hosted by TechNode Taiwan, ten startups from Taiwan, Brazil and New Zealand, each presenting 3-minute elevator pitch to the panel of judges. After much deliberation, the judges announced the top three startups: The first, second and third prize went to Syngency, Loopd and FIISER respectively. Winners will be given a free booth with a value over 12000 RMB in the upcoming TechCrunch Shanghai exhibit from June 8 – 9. Syngency empowers modeling agencies with feature-rich booking features and website management software, as well as convenient online and mobile tools and integration with cloud-based accounting. Agents can easily keep track of bookings and models can receive up-to-date booking and job information. The company has customers in English speaking markets, and is looking to expand into Taiwan, Hong Kong and Japan. Networking handful of unconnected people can’t guarantee that you achieve your goal attendance for an event. Loopd enables attendees to exchange contact information, collect marketing materials and check-in to the speaker sessions. Using physical analytics marketers are then able to build a more sophisticated understanding of their most valuable business relationships. Hearthstone’s latest adventure, Blackrock Mountain, took PVE content to new heights with a series of distinct and interesting boss battles. I caught up with Team 5 senior game designers Ben Brode and Mike Donais to chat through some of the cooler designs – how they tie into WoW, what the team was hoping to achieve and how they changed during the design process. IGN: Were there any particularly important lessons from Curse of Naxxramas that informed what you wanted to do with Blackrock Mountain? These days, gaming has entered the lexicon of ‘cool’. Expensive video game trailers set to expensive music blast onto TV screens at primetime, advertisements are splashed across buses in every major city in the world and E3 ‘press’ conferences are modeled after rock concerts. Kanye’s a gamer. Snoop’s a gamer. Mila and Aubrey are gamers. Everybody’s a gamer.